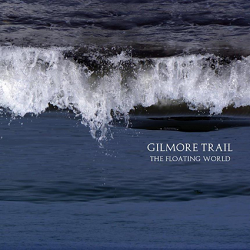 Sheffield based post-rock quartet Gilmore Trail have released their second album The Floating World. The band, named after a wilderness trail in remote Alaska recommended for best experiencing the Northern Lights conjure up an organic and awe-inspiring landscape of post-rock dynamics and upbeat intricate guitar parts. Think a mix of Mogwai, God Is An Astronaut and Explosions In The Sky – needless to say The Floating World comes out as an essential listen for any post-rock or instrumental fan. The piano led opening track, ‘Memories of Redfern’ transports you to a serene water based environment, the waves of guitars and crashing drums lap around you. As the track builds and builds the guitars become more and more emotive chilling you to the bone. Both ‘Waveless Shore’ and ‘Ballard Down’ shine in their expansive and sonic huge sounds. It’s easy to get lost in the maze of complex guitars. That sense of being in water or in a soothing bath continues throughout the album. As to be expected with most pure post-rock albums it’s a lengthy affair. The eight tracks come in at just over the hour mark, meaning that dedication is required to get through it in one sitting. Give it the effort and you’ll find that hour flying past, the emotive guitars of the title track and the almost effortlessly compelling dynamics of ‘Shifting Shores’ will thrill and entice. The 12 minute opus of ‘Origins’ is a real album highlight, the guitar riffs are heavier and have more immediate hit before mellowing and taking you on a journey that other bands can only dream of. The explosion of guitars and noise in the final section is simply superb. While The Floating World is an excellent post-rock album, it doesn’t break the mould and at times treads the same worn ground of its influences. Perhaps rather than being a negative this is testament to the quality of The Floating World – rather than being run of the mill you have a band four years after their first release can say they have realised an album up there with the finest post-rock albums ever released.